What Is The Difference Between A Deep Plane Facelift & A SMAS Lift? There are a lot of things to consider when you decide to take back your youthful look and get help with a facelift. Every person’s face is unique and solely their own so every facelift procedure must be tailored or customized to meet an individual’s needs. A frequent topic of discussion with facial rejuvenation is which of these 2 techniques seems best. The Deep Plane facelift and SMAS facelift are two different but highly effective techniques with the same main goal which is to restore a patient’s face with a more youthful appearance and reduce the signs of aging. Both can yield natural-looking, beautiful results for a patient, so what is the difference between the 2 procedures? Which one is best? Will my plastic surgeon have a method they prefer? All valid questions and since facelift procedures are one of the most popular cosmetic procedures being done today, Dr. Kevin Sadati wanted to provide some helpful information on the subject matter. Dr. Sadati is a board-certified and well-renown facial plastic surgeon in the Orange County/ LA area. He has been a guest and leading expert on TV shows such as The Doctors and has over a decade of surgical experience with an extensive medical background. He is also an educated sculptor and painter which allows him to create and provide natural-looking, transforming results for his patients. Let us take a more detailed look at each of these facelift techniques and what really matters for your facelift procedure. Essentially the technique and surgical care of a facelift procedure has come a long way. When first introduced as a cosmetic procedure, the single layer of skin on a patient’s face was simply lifted and tightened. It left good results for a patient but had issues of severe scarring without long term results. Then in the 60’s the facelift procedure was enhanced when it was realized that the underlying SMAS or Superficial MusculoAponeurotic System was the main factor to give patients longer results with the “lift” they really wanted. This dense connective tissue layer and muscles below the skin, which control facial emotion, showed if tightened during a facelift procedure along with the skin that it increased longevity as well as gave patients better end results. Taking all the pressure off of just the skin being tightened, this sublayer player in the facelift game provides the lifting power that this procedure needed. SMAS facelift: This facelift technique is a 2-part process with pulling or lifting the skin first then tightening the underlying layer of facial muscles or Superficial MusculoAponeurotic System. A more customizable facelift, it allows surgeons to accommodate for asymmetrical features and adjust the skin tightening process to allow for different angles in order to restore a patient’s overall appearance. Typically performed with incisions at the temple area, behind the hairline, in order to “lift” and place the SMAS into proper position to tighten and reduce laxity. The SMAS is also connected to the platysma muscle in the neck which lends a SMAS lift to allow for a lower face and neck lift at the same time. It basically gives the surgeon more control to customize and tailor this procedure to deal with each patient’s individual needs for their facelift. Deep Plane facelift: This facelift technique was developed in the early 90’s by a surgeon who decided the facelift procedure could be done differently by lifting the skin and the SMAS as one single unit instead of in separate steps like with the SMAS facelift. This technique does allow for better blood circulation for all parts but doesn’t allow for it to be more tailored since everything is adjusted in unison. Typically performed with incisions in the hairline and around the ears, this facelift technique does what it says which goes deeper and is a good solution for patients with deeper lines or looser skin in the jowl area. It can even rejuvenate the cheek area. Essentially both facelift techniques have pros and cons to them but ultimately both techniques can provide patients with the results they desire which ultimately is to look younger! It comes down to is what is the preferred method of choice for your plastic surgeon. Both facelift techniques can offer amazing results, to patients in the Orange County area, so what really matters is not so much about the technique but about the surgeon performing the procedure. 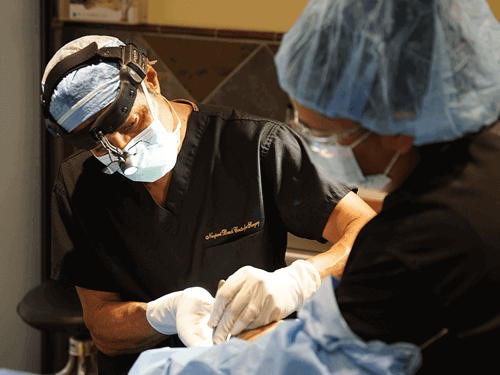 A board-certified plastic surgeon, like Dr. Sadati, will have a preferred technique and be able to show before and after results of his actual patients. Procedure preference should be based on the experience a surgeon has utilizing which one and what type of results his patients were able to enjoy. It is more important to choose a plastic surgeon who has had successful results, listens to their patients and has the qualifications necessary to perform this cosmetic surgery regardless of which type of technique is used. A facelift is a highly skilled and detailed surgical procedure no matter what technique is used. A plastic surgeon’s skill, experience and training is what is the main priority. The debate on which technique should be used is really no debate at all. A qualified, board-certified plastic surgeon like Dr. Kevin Sadati, will determine the best course of action for your facelift needs and customize the surgical experience to get you the results you need. With over a decade of experience and voted “Best Cosmetic Surgeon” for 3 years in Orange County, Dr. Sadati is well known for creating beautiful, natural-looking results for his patients time and time again. If you are interested in a facelift consultation, call or schedule your appointment with Dr. Sadati today.